Packing Day #1. Over. We all survived. Good thing for Lily since she nearly got stepped on or had something heavy set on her many times throughout the day. Unlike her typical day of full-time napping, she was up and active the entire day. I have a feeling she’s going to just collapse by the end of this all and not move for the better part of a week. Our movers are very, very nice. They wanted burgers and fries for lunch and when I was placing the order it sounded really good. I don’t think I’ve had a REAL burger yet this year. It totally hit the spot, more so because ordering take-out is an almost-never treat. But, ya know, when every square inch of your kitchen is covered in every plate, glass, bowl, platter, and pan you own…you eat a burger. The move is exciting, but it’s always bittersweet. I’m going to miss a few things about Ohio like Tim Horton’s coffee, Lily’s vet, my hockey team, Donna & Gina, and…Kroger’s 10 for $10 pineapple sales. Just as we began the task of whittling down our food supply, Kroger had their pineapples go on sale and I am incapable of passing up $1 pineapples. “I hope you have a plan for these, Nicole!,” Mr. Prevention snarked. Husband, puh-lease. I have recipes saved for every occasion, including pineapple sales. I made a crisp with one of the pineapples. Recipe coming soon. With the other pineapple, I made these Pineapple Upside Down Pancakes. Both excellent choices, I must say. As I was making these pancakes, I was thinking to myself, “I wonder if they’ll be as good as they sound.” Because to be honest, they weren’t the easiest thing to make. Not difficult, but an extra step or two from your run-of-the-mill pancakes. If you let that piece of information deter you, it will only be your loss. You’ve been warned – these are epic! Melt butter with cinnamon in a large heavy skillet over medium heat. Cook until butter begins to brown, about 2 minutes. Add pineapple slices; cook until light golden brown, 4-5 minutes per side. Remove skillet from heat; add rum and brown sugar. Cook over medium-high heat until juices are thick and syrupy. Transfer pineapple to a plate; let cool. Reserve syrup. Whisk first 4 pancake ingredients in a large bowl. Add milk/buttermilk and next 3 ingredients; whisk until smooth. Heat a griddle or large heavy skillet over medium heat. Lightly coat with nonstick spray. Working in batches, pour batter by 1/4-cupfuls onto griddle. Cook each pancake until golden brown and bubbles form on top, about 2-3 minutes. 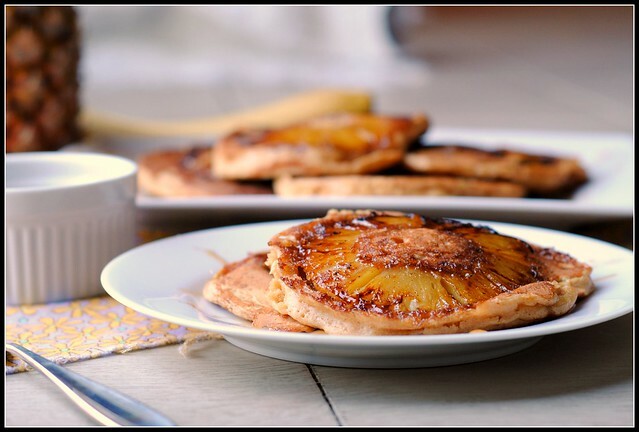 Top each pancake with a pineapple ring. Flip; cook until pancake is golden brown, about 2 minutes. Rewarm reserved pineapple syrup. 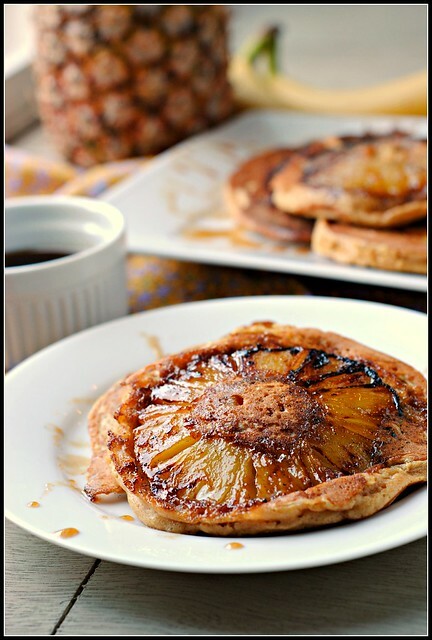 Divide pancakes among plates; drizzle with pineapple syrup. Serve hot. Result: Truthfully? One of the best breakfasts I’ve had in a long time. These are right up there with the pretzel and white chocolate pancakes I had in Chicago last month. SO GOOD! Thanks to the whole wheat flour and pineapple, this breakfast offers up a generous 4.5 grams of fiber and a respectable 421 calories. You won’t regret making these one weekend morning, I can guarantee that! Enjoy! Dentist then Day #2. I think I can…I think I can…! I’ll have to get some pictures of the chaos to get up tomorrow. YUM! 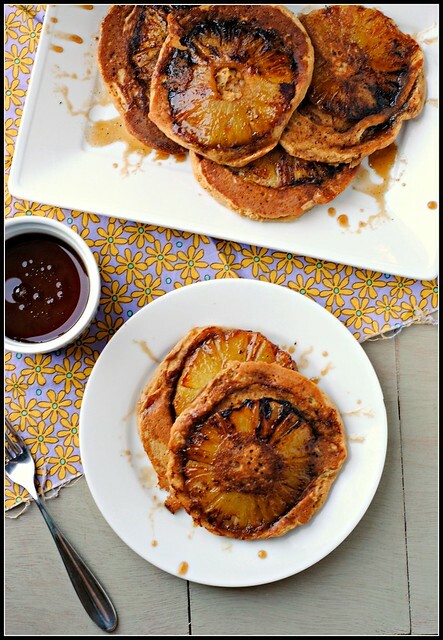 This combines two of my favorite things – pineapple and pancakes. Not only do they sound delicious, but with the pineapple ring, it looks really impressive! I can’t wait to see the crisp recipe. Don’t worry! We have Kroger in Michigan! It’s usually more expensive than Meijer so I don’t usually go there, but I’m pretty sure they have 10 for $10 pineapples. I know they have 10 for $10 mini bottles of wine… 🙂 good luck packing/moving, it’s probably my least favorite thing to do. When we moved in March, i pretty much just threw things in boxes, way unorganized! 10 for $10 wine? That’s impressive. Even if they are mini bottles. Good movers are seriously CLUTCH. We had some really nice ones last year. After all the horror stories I’ve heard in the past, I felt very very lucky! I still have 3 pineapples worth of cubes in the freezer. We had to get a raincheck from Kroger for ours. I’m hoping they do it again soon so I can make these pancakes! Glad you had a successful move! Our Kroger doesn’t offer $1 pineapples – I’m so jealous! Poor Lily – she’ll sleep for days when this is all over! Love the idea of this breakfast Nicole – it would be a show stopper for a brunch for sure. Hang in there! These pancakes look fabulous!!! Love this use for pineapple. I’ve been looking for some new breakfast ideas to make on summer weekends when we have company. I can’t wait to try this recipe. Good luck with the move! these are just gorgeous! 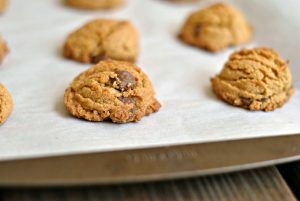 Saw them on FG…and how delish do they sound! YUM! And a 1/2 cup of rum for breakfast…love the way you think! Oh my soul, Nicole! Absolutely divine pancakes! Poor Lily! Packing is so stressful for animals! My cats acted weird all week when we were packing. Glad to hear everyone survive though! These pancakes sound divine and your photos are gorgeous! Yummy! These look awesome 😀 Hope everything’s going smoothly with your move! 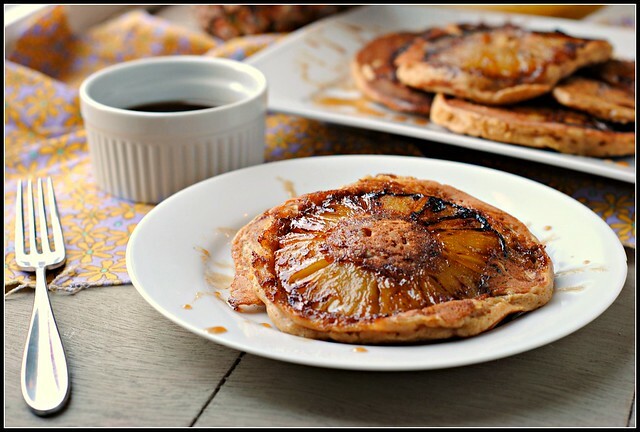 I did a slight variation on these today using a can of crushed pineapple (already open and needed to be used up) with the brown sugar, rum, and cinnamon to make a syrup for the pancakes. It lost the upside down pineapple effect but made for a delicious sauce! These were not the easiest thing to make, but they sure tasted good…right?! 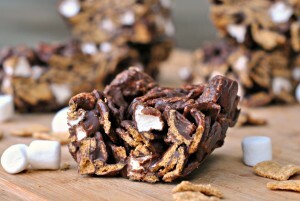 No Bake S’mores Bars + 5th Annual Chili Contest Details! !